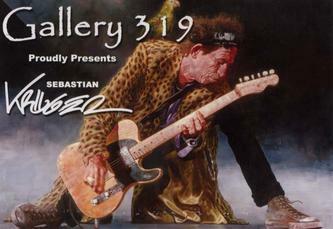 Last night I went to a reception for artist and caricaturist Sebastian Kruger at Gallery 319 in Santa Monica. I had previously seen much of his artwork on the internet and several pieces, mostly prints, in person. However, last night I was able to see a large quantity of his work in person, much of it originals. It was excellent! Some of the pieces were very large and the color and detail was beautiful. Many of the images were also very entertaining and funny caricatures. And, if you are a fan of the Rolling Stones, it’s a must that you take a look at his work. He is a fan of the Stones and has developed a friendship with the band. Many of his pieces include images of Rolling Stones band members. However, his work also includes such well known personalities as Jimi Hendrix, Steve McQueen, Elvis Presley, Madonna, Sting, Arnold Schwarzenegger, Bill Clinton, and many more. Check out my Art of Celebrities page for more links to Sebastian Kruger’s work.